When my Murray patients ask me about tooth restoration, I usually tell them about fixed (or ‘traditional’) dental bridges or tooth implants. A dental bridge is an artificial tooth which replaces a missing tooth. The false tooth (called a ‘pontic’) is fused to porcelain crowns on either side of the missing tooth. Tooth replacement has been a highly requested procedure at my Murray dental practice. Patients from the Taylorsville area and Draper area have expressed concern about tooth replacement for many years. Most of my questions in the Salt Lake City area have to do with the strength and durability of the tooth replacement. 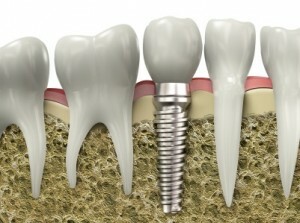 Dental implants are also popular in Salt Lake City. 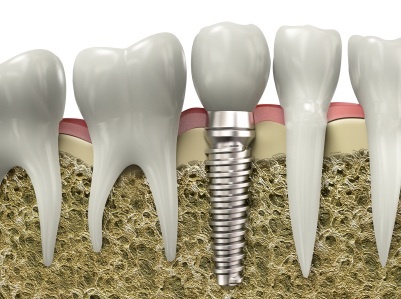 A dental implant consists of a titanium post surgically inserted into the jaw bone to replace the root of the missing tooth. The post integrates with the bone to provide a stable foundation for the replacement tooth. After the post has bonded with the bone (it usually takes three to six months), a smaller post is attached which extends above the gum line. The artificial tooth (crown) is then attached. The entire process takes several months, but consistently yields terrific results for Murray tooth restoration patients. Both Utah smile restoration options preserve or restore facial contour and allow you to talk and eat normally. Tooth replacements prevent adjoining teeth from gradually shifting and can help correct bite problems, too. Tooth implants and dental bridges can replace one or more missing teeth. Many Salt Lake City area dental patients have been treated successfully with these tooth restoration alternatives. Call Salt Lake Dental Care and ask to schedule an evaluation for Utah tooth restoration with Dr. Clint Blackwood. You can schedule your tooth restoration by calling us at 801-938-8855.